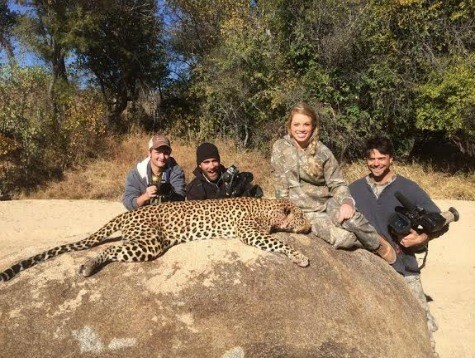 HOUSTON, Texas–Nineteen-year-old Texan Kendall Jones is a Texas Tech University Cheerleader, an aspiring-television host, and a hunter. She has also drawn the ire from animal rights groups and activist for hunting and posting pictures of her recent hunts in Africa. Jones was nine when she went on her first trip to Zimbabwe with her father and watched as he hunted big game. When she was thirteen she shot her first animal, a White Rhino in South Africa. By the age of fourteen Jones had also shot an elephant, a Cape buffalo, a lion, and a leopard. It is her love of hunting that has drawn protests and anger from activists. According to a report from the DailyMail, two petitions have been launched against Jones. The first is a petition to remove her Facebook page because Jones had posted pictures of her hunts which some activists call “animal cruelty”. That petition has over 49,000 online signatures. A second petition wants to ban Jones from Africa completely. Online petitions are not the only thing Jones is dealing with. Jones’ Facebook page has been the center of debate with some defending her hunts and others condemning them. Some Facebook commentators have even gone as far as to call for Jones to die for participating in hunts. KFYO-AM in Lubbock reported that Texas Tech University official, Chris Cook, only had a short response to the controversy in which the trip “was a private hunting trip the student took with her family and was unrelated to Texas Tech.” Jones is a Sophomore at Texas Tech focusing on Marketing and Sports Therapy.